Not many people can credit Porta-Loos for their success in the film industry, but Shane Jacobson- an Australian performer best known for his role as loveable dunny-man Kenny- can make that claim. In this often funny and highly interesting autobiography, Shane tells of his extraordinary (albeit wayward) acting career, leading up to, including and moving on from his performances as the well-known Aussie character. Told with an honest and passionate voice, Shane’s book details all of the highs and lows of his career, beginning with his childhood in the semi-rural and suburban areas of Melbourne. Along with his older brother (director, editor and film producer) Clayton, older sister Kim and younger sister Natalie, Shane grew up in a relatively normal family setting. Although his parents split up when he was four, his life was stable and full of love, with his parents and their respective partners adopting an easy-going and encouraging environment for their children. Coming from a performance-based background (Shane’s paternal grandfather was a carnival man), and with his mother a calisthenics teacher, it’s no surprise that Shane quickly grew to love having an audience. He and his siblings would put on performances for the rest of the family, as well as the kids at the campsites where they stayed each school holidays. An intense love for sport (including boxing and motor racing) ran through his veins, thanks to his father’s passion, and so the Jacobson clan were also very active while they were growing up- racing makeshift rally cars and dirt bikes, swimming, waterskiing and participating in Ironman competitions. As a result, most of Shane’s childhood was made up of sporting adventures, the scouts, and Gang Show- an amateur theatre troupe for young people which put on shows during the year and toured nationally. Besides these interests, Shane also attended school and held down several part-time jobs. As he grew older, Shane always maintained a strong passion for performing. Although an accomplished actor, singer and dancer, his performing career kept getting waylaid by other jobs and interests. These included stints in fraud prevention for the Westpac banking corporation, wiring up the sound and lighting for various gigs and working as a fireworks technician for large events and festivals. He also worked as a sales representative, bouncer, cover band singer and paper round boy, and travelled through Sweden for a few years. It wasn’t until his brother decided to enter their short film about Kenny into the St Kilda Film Festival that his performing career really started to take off. Despite small but successful dalliances with the theatre and music scenes, Shane’s star only truly began to shine when his role as the lovable larrikin Kenny was made public. Following Clay’s insistence that he remain in character while doing promotions and interviews, people soon began to believe that Kenny was a real person, rather than a character borne from the imaginations of two Melbourne brothers. When the short film spawned a feature-length film, as well as a TV show, this view was cemented in the publics’ minds, even though the brothers never intended to fool anyone. As recognition for Shane’s talents began to grow, so did his career. He got to work alongside some of Australia’s most respected and talented performers- Geoffrey Rush, Hugh Jackman and Paul Hogan, among them. He was also privileged enough to meet many other famous people (including his personal heroes) through his work, and perform in a host of movies, telemovies, television programs and stage shows. He has won a collection of awards for his performances, and has hosted award shows and keynote speaker events. Through it all, he has kept his easy-going, blokey nature, and raised a loving family of his own with his partner Fliss. 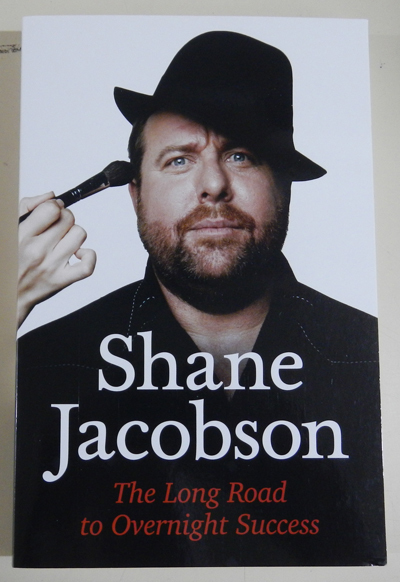 Even if Shane Jacobson hadn’t become a well-known Australian actor and presenter, his life story would still be an interesting and diverse read. It’s easy to see why it took so long for his career to ‘begin’ when you read about all of the things he did on the pathway towards fame. With such a jam-packed and fulfilling life, it’s clear that his career is only going to continue to grow.